When a Music Hall hypnotist escapes from the London County Asylum she leaves a single word on the wall of her cell - scrawled in blood: 'MAGISTER'. Terror then stalks the capital's streets as the killing spree begins. But why does Superintendent William Melville of The Special Branch call upon the skills of brilliant stage magician Michael Magister and his glamorous assistant Phoebe Le Breton to help capture the murderer? Especially as Michael is one of those named on the death list. 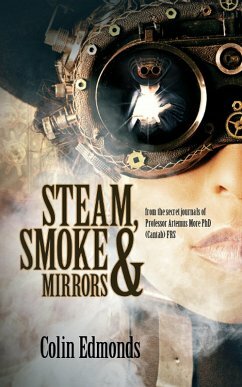 From the recently discovered journals of Professor Artemus More, secrets are laid bare, mysteries revealed, illusions exposed and conspiracies uncovered, all in a Steampunk vision of Victorian Britain. But is anything truly what it seems? Or is it all just Steam, Smoke and Mirrors?